For over 40 years, the 42m war-time tug, Sprightly put to sea on a variety of important scientific missions. The Sprightly was originally a salvage vessel in the North Atlantic before becoming a CSIRO reseach vessel. 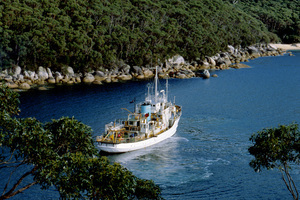 The Sprightly was retired in 1985 and replaced by CSIRO's new oceanographic research vesel, the Franklin.